Coming this summer M. Night Shyamalan's long awaited sequel "The Sixth Dog." Last month Officer T. Branford received a call regarding the delayed report of a robbery. Upon arriving to the scene Officer Branford determined that his victim had been robbed by gunpoint. This robbery had been orchestrated by suspects who were utilizing a well known internet posting web site that allows a centralized network of online communities, featuring free online classified advertisements. These suspects would locate their potential victims by searching the web site for listings by people who were looking to purchase a particular type of cellular phone. Once contacted the suspects would arrange a meeting place with the victim then rob them at gunpoint. Officer Branford discovered that on this date the suspects had also contacted the victim’s friend and was attempting to set up another robbery that was to take place within the hour. Knowing that time was of the essence Officer Branford began making preparations to get these dangerous suspects into custody. Officer Branford immediately requested backup to his location. Once there, all of these officers worked quickly and began devising a plan to apprehend these armed suspects in the safest possible way. Devising this tactical plan was made even more difficult due to the fact the suspects were relentlessly calling the victim’s cell phone and pressuring to meet at a nearby location. The officers quickly changed locations to a parking lot of a large strip center and began implementing their plan where the robbery was going to occur. Keeping the victim out of harms way, the officers created an unseen perimeter by manning key entries and exits. All roadways in the area that could be used for a quick escape were strategically monitored. Due to the multiple avenues of approach and uncertainty of where the suspect’s vehicle would arrive from this large perimeter required many officers, all of which were working in concert in order to ensure the capture of the suspects without incident. As if on queue, the suspect’s vehicle arrived in the area. Officers quickly obtained a positive identification of the suspect’s vehicle by the victim then conducted a flawless felony stop and ultimately detained both suspects without incident. During the investigation a pistol, which was later found to be stolen in a burglary, was recovered in the suspect’s vehicle. According to Robbery Division investigators these suspects were linked to several other robberies in the area. Investigators also learned that these suspects had planned additional robberies for later that same day, but were arrested before they could commit them. But for the cohesiveness of officers T. Branford, P. Ungaro, B. Bourgeois, E. Castillo, C. Moralez, C. Mays, D. Titus, K. Gibson, J Johnson, X. Flores, J. Mclemore and Sgt. S. Arnold and their ability to quickly adapt to this challenge, two dangerous suspects were ultimately arrested and charged with aggravated robbery before they were able to harm others. 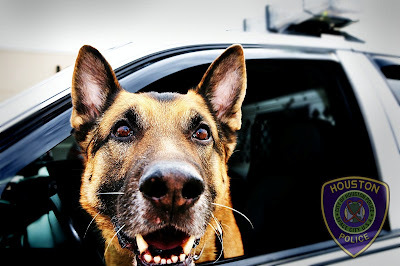 Thank you for the support of the HPD BLOG this year! 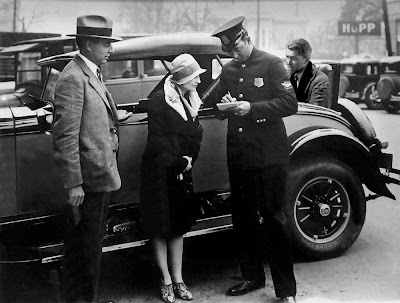 This is an actual photo from the 1930's of an HPD officer giving the lady a... holiday pie recipe. 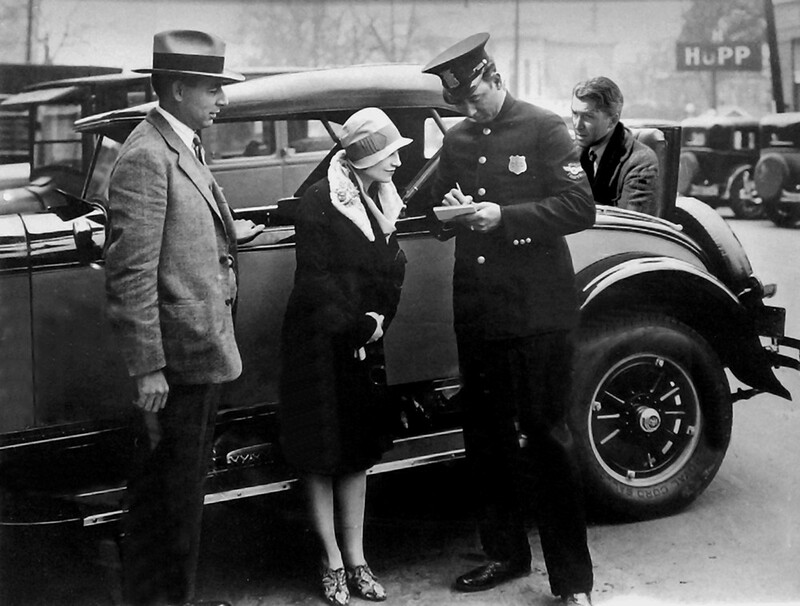 Don't worry about George in the rumble seat, if you've seen the movie things work out in the end. Happy Holidays to you and your family. Please be safe and aware of your surroundings as you travel the city and across the country. Thank you for the continued support and your interest in the Houston Police Department. I will be off until December 27, 2010. Your emails to me will also be returned starting on that date. 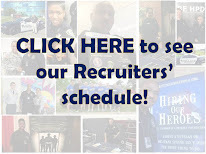 If you need immediate assistance please call the recruiting office at 713-308-1300. One night back in October, Officer R.Estrada and his partner were dispatched to a shooting at an apartment complex where a victim had been killed. Upon their arrival, they observed two males running from near the scene of the shooting. Officer Estrada and his partner chased the males on foot, securing one of them after... a brief pursuit. During the chase, the suspect who was apprehended, had thrown a handgun into the bushes near the shooting scene. The suspect was charged with Unlawfully Carrying a Weapon and Evading Arrest, but due to the proximity and nature of his actions, they listed him as a suspect in the murder case. Homicide detectives sent the suspects pistol for ballistic testing to help determine if he may have been the shooter in this incident. The following night, Officer Estrada received a call to check by on another shooting that occurred in his patrol area where the victim also died. Other patrol officers arrived on the scene and provided a description of the shooter and his vehicle. Officer Estrada began to look for the suspect. It did not take long for Officer Estrada to locate a vehicle matching the description and to pull alongside and see that the driver matched the description of the suspect. Officer Estrada initiated a traffic stop and detained the driver. Officer Estrada located a handgun hidden under the rear seat of the vehicle and noted blood spatter on the suspect’s clothing. This suspect was detained for Homicide detectives for follow-up investigation. 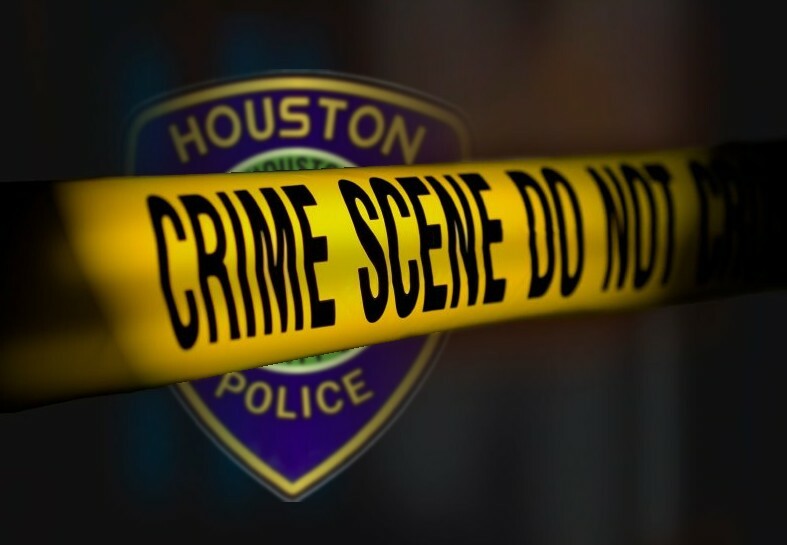 It was later determined that the arrested suspect was driving a vehicle that was taken in a robbery earlier in the night, and he was charged with Aggravated Robbery, pending the outcome of the capital murder investigation. As the result of his quick response, determination and attention to duty, Officer R. Estrada was involved in the arrest of two suspects, which are likely involved in each of these murders. These dangerous suspects have been taken off the streets and are awaiting for the conclusion of the respective murder investigations. Due to Officer Estrada’s actions in these incidents, HPD would like to commend him for a job well done. "Ma, give me a break will ya?" "Sweetheart, you forgot your sunglasses." On Tuesday, Dec. 7th 2010, Houston Mayor Annise Parker, Police Chief Charles A. McClelland, Jr., the HPD Mental Health Unit/Crisis Intervention Team (CIT) and several partners of Houston's mental health community were recognized by the International Association of Chiefs of Police (IACP) and corporate sponsor Cisco for their outstanding efforts in a community policing project. The project sought to reduce the number of encounters between identified individuals with serious and persistent mental illnesses with the Houston Police Department, and to identify unmet needs and barriers in the community that contribute to an individuals inability to engage and remain in mental health treatment. 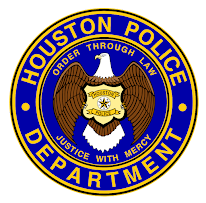 The HPD CIT program provides officers with training on mental illness and crisis intervention/de-escalation techniques. This training is proven to help officers de-escalate situations involving individuals in serious mental health crisis. The goal of the program is to keep officers and mental health consumers safe in these encounters. The training results in a more professional, effective and humane response by law enforcement officers to individuals with mental illness. It's more than a career, it's more than just putting the crooks in jail, it's a calling. Being a police officer is not for everyone. You genuinely must care on all levels. It takes a special person to wear this badge. Last month, Houston Police Officers Priscilla Rayon, Rebecca Skillern, Frank Webb, Sergeant Marco Loera and Lieutenant David Fausek participated in the 10th Annual Houston Buddy Walk, Down Syndrome Awareness Event in downtown Houston. The look on these children's faces when these officers placed a medal around their neck is something you will never forget. I would like to personally thank the officers that participated in this event. I am proud to call you "family." "WHAT IS" vs. "WHAT IF"
The only way to consistently take action and build momentum is to think about what is happening here and now; that means thinking about WHAT IS and not worrying about WHAT IF. What IS thinking places your attention on the present moment and what needs to happen now to bring you closer to your goals. What IF thinking places your attention on a fabrication of a potential future that doesn’t even exist and may never exists…this is wasted effort. B. Pate were recently awarded a Chief of Police Commendation from Houston Police Chief Charles A. McClelleand Jr.
Citizens in Hyde Park and East Montrose communities had expressed concerns regarding a rash of residential and motor vehicle burglaries in their neighborhoods. Sergeant R. Wilson initiated a program that educated the residents and helped them avoid becoming victims of crimes. Sergeant Wilson and his officers contacted over 700 households in the East Montrose and Hyde Park communities and spoke to over 160 residents, advising them of how to secure their property, to call the police about suspicious behavior, and to participate in Operation ID. Sergeant Wilson and Officer W. Pate met with various community members on several occasions to hear their concerns and provided assurance on the department’s efforts to solve the crimes. However, the crime spree continued and evidence suggested that the crimes were being committed by serial offenders. In October of 2010, Officer J. Obenhaus was on patrol and heard a burglary in progress call one block from his location. He noticed a possible suspect fitting the description walking quickly from the scene. Officer Obenhaus caught the suspect a few blocks away and found him with stolen property. The Crime Analysis Unit completed an audit of the burglaries in the Hyde Park neighborhood and their research indicated that over 100 burglaries might be attributed to this suspect. During the same week, a witness saw a suspect breaking in to his neighbor’s house and yelled at him to stop but the suspect fled on foot. Patrol officers arrived and were able to capture the suspect. It is believed that this suspect may have committed over 50 burglaries in the East Montrose neighborhood. O. Maldonado. A subsequent investigation uncovered a substantial amount of stolen property, resulting in the suspects being charged with several crimes. As a result of the hard work, dedicated attention and perseverance of all these officers, four prolific thieves were arrested and charged with various crimes and a successful resolution to a troubling crime pattern was achieved. 209, What did you do? Many careers change throughout ones lifetime. Once you become part of a team, family and institution such as HPD, you won't want to leave. Being a police officer is unlike any career you have had before. The camaraderie is hard to explain unless you experience it for yourself. Class 2o9 will be close forever, and many, if not all, will go on to a long and storied career with HPD. Six months of hard work, extensive studying and time away from the family is hard to endure at times. Class members of Academy Class 209 completed their academy class on November 30, 2010. The "What did you do?" videos have proven to be very popular not only among my readers, but by the cadets as well. I encourage the cadets to let loose and be themselves for a bit. After all, the hard work paid off and they were about to graduate later that night. These segments often have a touch of humor in them. Class 209 was no exception. Stay safe 209 and welcome to the family. Tradition held strong as HPD Cadet Class 209 held their final roll call as the sun rose above the police academy yesterday morning. A cold front was blowing in that morning and it was windy and cold. I have a feeling that the cadets never felt the elements as the excitement was too strong within them. Cadet classes will stand in formation during roll call and will announce their names one by one very quickly. Throughout training, roll calls are done the same way every time, every morning. However, on graduation day, such as Class 209, it is done a little differently with each cadet of Class 209 slowing down and pronouncing their name loudly and proudly. 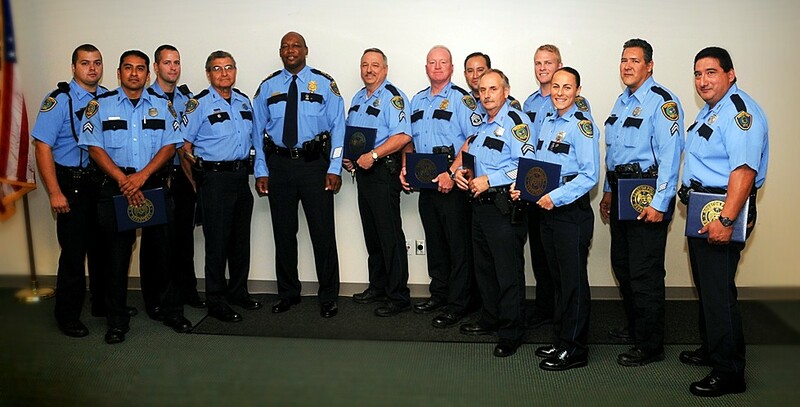 Later that night, 67 men and women graduated and began wearing the blue uniform and started their new journey protecting the citizens of Houston. Congratulations 209, as your class motto states...TIME TO SHINE!